I had a bunch of meetings on Friday, so after spending the morning doing a wee bit of writing, I hopped on the bike and headed down to the west side to catch the shuttle to work. Because the police state that is Baltimore-under-curfew is confined to only certain neighborhoods, my ride downtown through Charles Village, Station North, and Mount Vernon was fairly cop-free, until I took the right and left toward Lexington Market. Even there, the streets were filled mostly with the usual pedestrians, safety cones blocking off parking, and the cop cars that always circle this neighborhood. I locked up the bike outside the medical center and joined the two National Guard officers with their fingers on their triggers–are they trained to do that?–to wait for my ride. My colleague N. and I were parked on twitter in the car, waiting for updates. Marilyn Mosby was going to do a live press conference, she told me. I retweeted, willed the shuttle to get to school in time for me to watch it, and then ran up to my office to see what Mosby had to say. It was 10:44, and I was not happy to have to sit through a 30 second commercial for Snapple when I might have been missing it, but capitalism certainly isn’t taking the week off, even if stuff has to close by 10pm. And then I listened to Mosby announce that she’d be filing charges against the officers who falsely arrested Freddie Gray and then killed him. I closed my office door so I could weep. I can’t explain why I was crying, but there I was, and I’m not feeling the need to understand all of this in all of its complexity right now. And then I went to my meetings, a campus-wide teach in, another couple of meetings, and then I met dozens of students for the shuttle back to the city, the one I usually share with just a couple of other people. These students were headed to the May Day Rally at McKeldin Square, and their excitement was palpable. We had to leave a bunch of students behind, even with the larger bus that had been arranged for the event, and one person puked on the hot, cramped, bumpy ride, but hey, we made it. I picked up my bike and walked the crowd over to the square, lined by cops and cattle gates, penning the rally in. I tried to walk up to the gates on the grass and was pushed back–“Ma’am, you have to stay in that area.” Why? No answer, just the repeat. This is public space–it’s even a “free speech zone,” whatever that is. I jotted it down on my long list of State Power WTFs and left the area, taking my bike to catch up with the march. I hate crowds, even excited and joyous rally crowds, so it wasn’t long before I found myself riding on the outskirts of the rally, which was totally encouraged by the line of soldiers blocking so many streets. 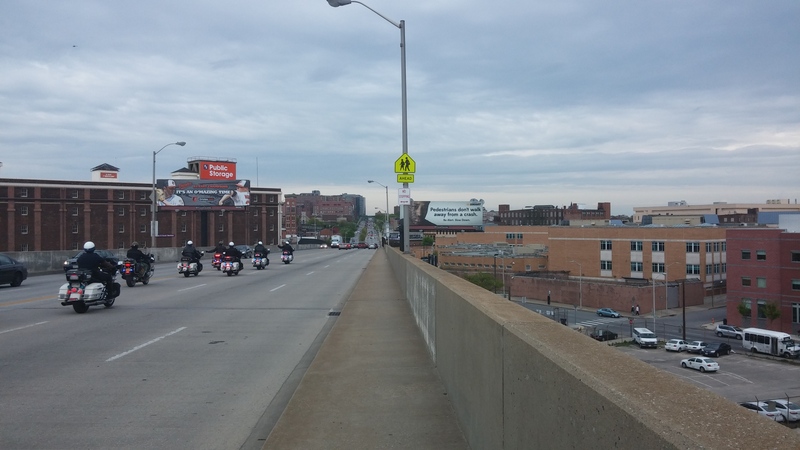 I ended up biking on the sidewalk on Orleans Avenue, westward bound over I83. I snapped this picture as a long line of BCPD cops zoomed east. I wondered where they were headed, who they were heading off, especially as the march headed north and west. That’s one of the creepier things about the current occupation for me–it’s on top of the one that’s been here for a long time, and while our eyes are watching it over here, what’s it doing over there? Is it business-as-usual, the same unlawful imprisonments Mosby finally named yesterday? It’s already a police state, even if for some of us it’s the first time it’s keeping us from drinking at the bar after 10pm. And then I was back on the bike, walking, biking, walking, chatting, walking, biking, home early, happy that so many people got to feel the rush of so many things–including taking North Avenue from the cars. God, it feels good to walk in the streets. This entry was posted in parades, police and tagged Baltimore, marches, May Day, police, police state, rallies. Bookmark the permalink. I just “met” Kate online after following her blog off and on for a couple years. And I nlike me, she actually has been attending the demonstrations, even though she says she hates crowds! (I don’t have an excuse.) Her account of last night’s peaceful protests– which received little to no news coverage, from what I can see– underscore how problematic are the relationships between power, authority, race, and class in this country and especially in Baltimore.